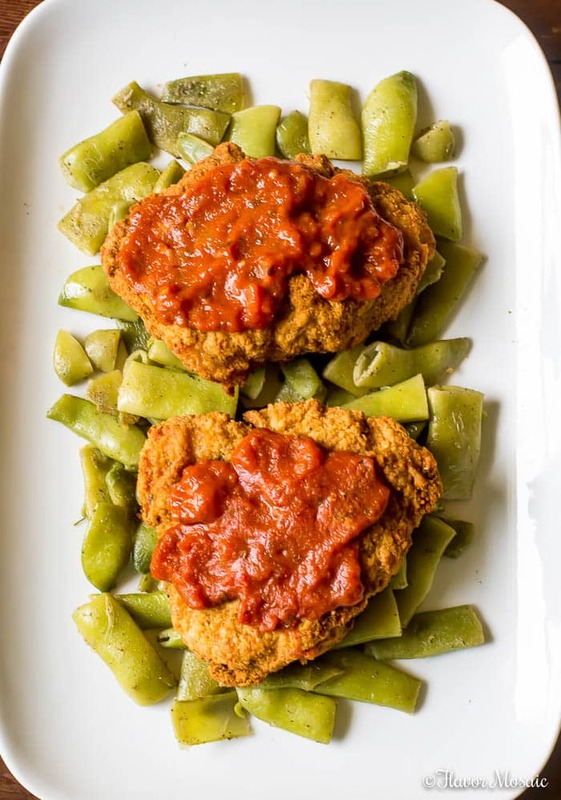 You can enjoy this Tyson® Fully Cooked Dinner and Entrée Kit – Crispy Chicken Pomodoro as an easy and delicious weeknight meal and have it ready in 20 minutes. With work (my day job), blogging, and family, including being a caregiver to an elderly parent, I don’t have a lot of time to spend on dinner. A meal that goes on the table has to be quick and easy as well as delicious. Because, if my family doesn’t like it, then what was the point? Taste is everything! It has to be delicious or else I won’t be serving it, period! 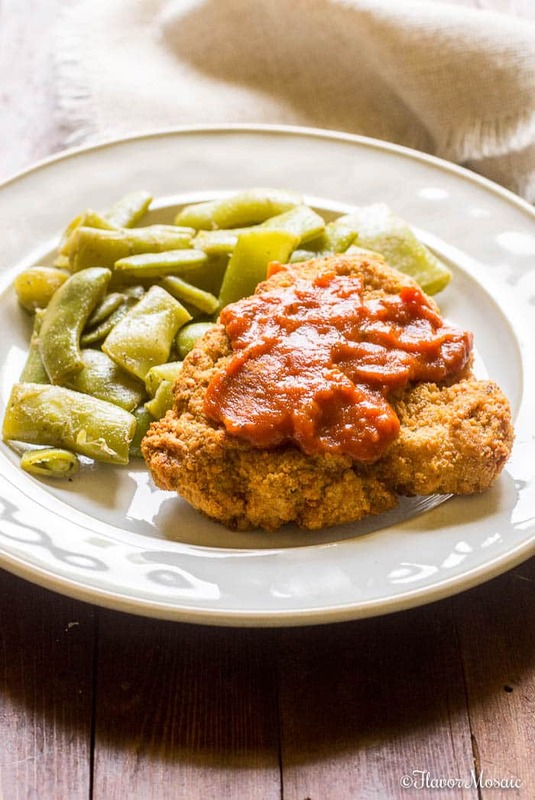 When I tried this Tyson Fully Cooked Dinner Kit – Crispy Chicken Pomodoro, with its Italian Flat beans and Tangy Red Sauce, I was so excited because it met both criteria. It is both easy and delicious! 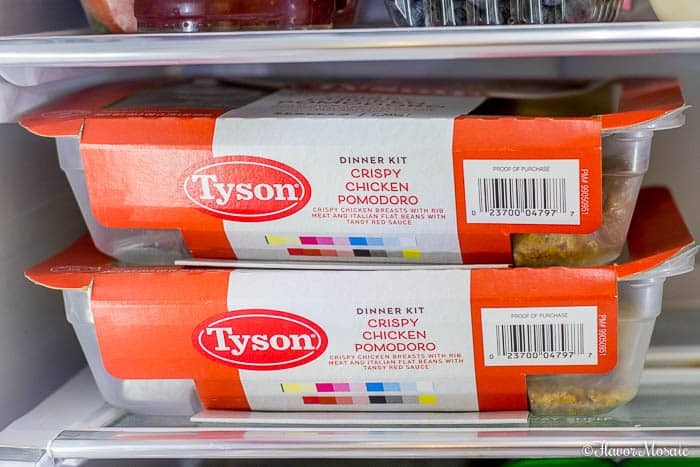 WHAT ARE TYSON FULLY COOKED DINNER AND ENTRÉE KITS? 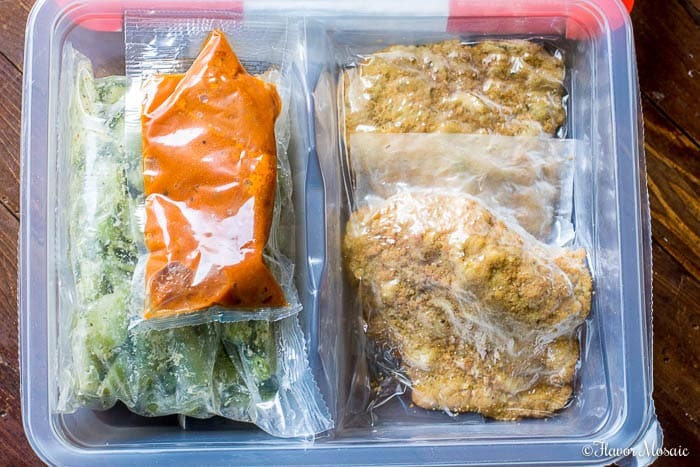 Tyson Fully Cooked Dinner and Entrée Kits are made with high-quality protein, such as chicken or steak, and fresh vegetables that are prepped and perfectly portioned, then frozen at the peak of freshness. The Dinner Kits include a vegetable side while the Entrée Kits do not! 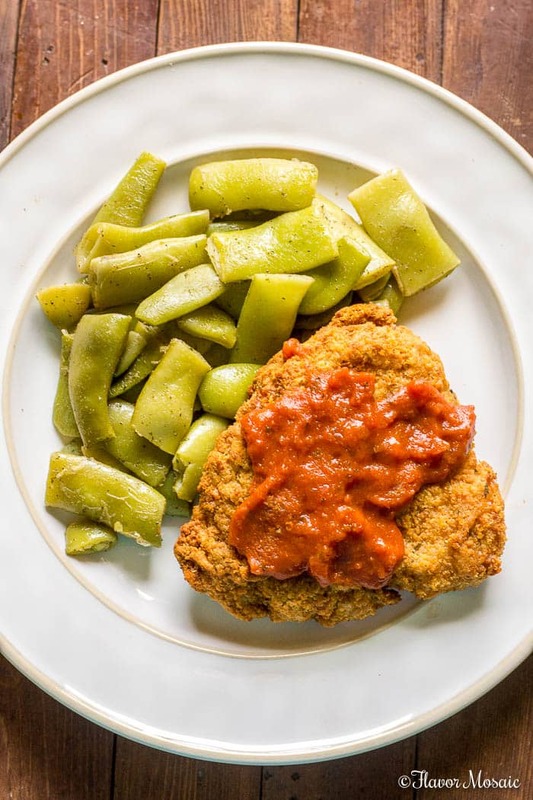 That’s why I love this Chicken Pomodoro Dinner Kit because it includes one of my favorite vegetables, Italian Flat Green Beans, which makes a delicious meal that fills me up. Also, all natural* Tyson chicken is minimally processed, with no artificial ingredients added, and is raised with No Antibiotics Ever. 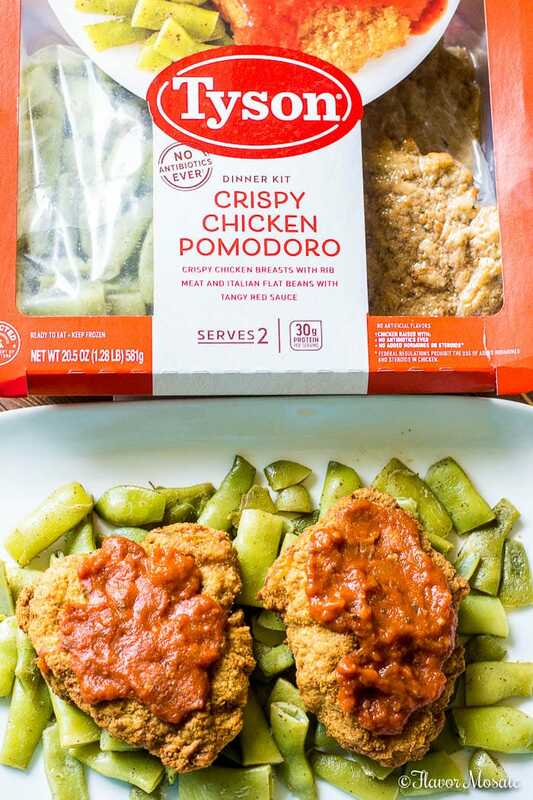 If you love the Tyson Fully Cooked Dinner Kit – Crispy Chicken Pomodoro, then be sure to check out these other Dinner and Entrée varieties available at HEB! I can’t wait to try all of these varieties. My husband has specifically requested that I buy the Tyson Fully Cooked Dinner Kit – Seasoned Steak Fillet & Mushrooms next time I’m doing my weekly shopping at HEB. WHERE CAN I BUY TYSON FULLY COOKED DINNER AND ENTRÉE KIT? I found it in the freezer section of my local HEB. Be sure to check out your local HEB’s freezer section for your favorite variety. 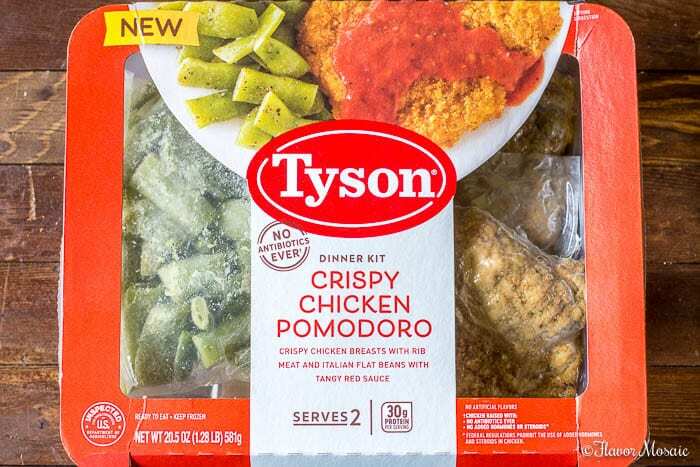 HOW EASY TO MAKE IS THE TYSON CRISPY CHICKEN POMODORO MEAL KIT TO MAKE? This recipe consists of only 2 steps. I’ll show you step by step how easy it is to prepare this meal per the package instructions. Everything you need to have dinner on the table is included in the package. 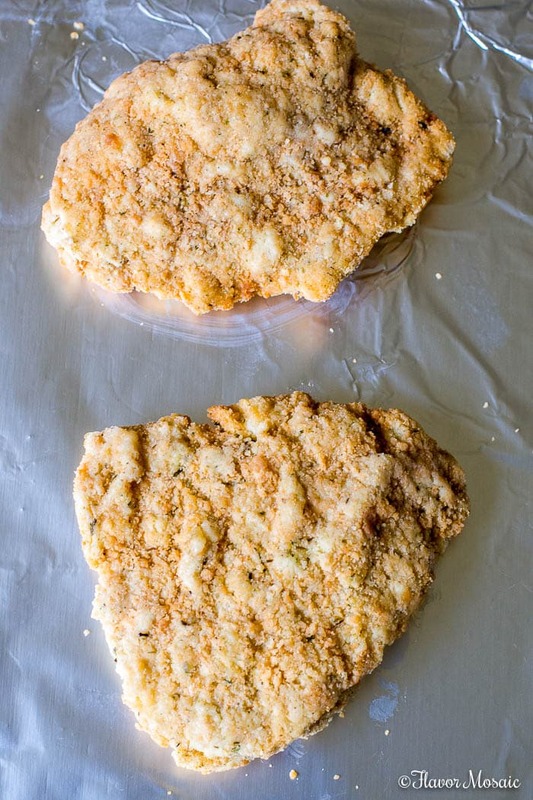 Just unwrap the chicken breasts from the plastic and place them on a foil-lined baking sheet. Bake them in a preheated 475 F degree oven for 18 – 20 minutes. While the chicken breasts are baking in the oven, you can cook the green beans. Add the green beans and a tablespoon of water to a skillet and cook for 5 minutes covered. 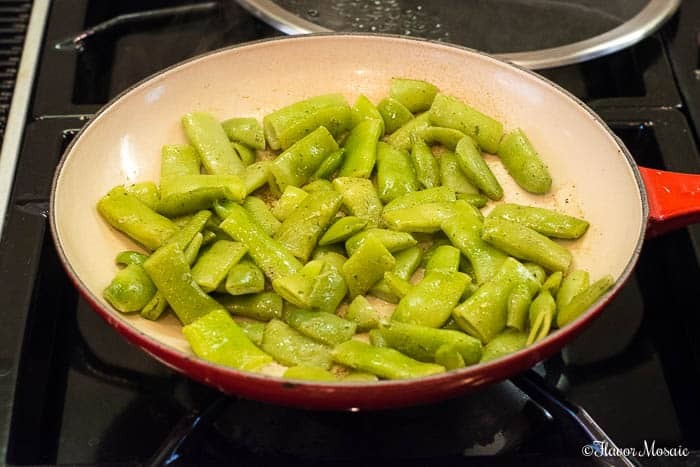 Then uncover the green beans and cook for 3 to 5 minutes more, or until they reach an internal temperature of 165 degrees F. Stir the green beans occasionally. The final ingredient is the tangy red sauce. 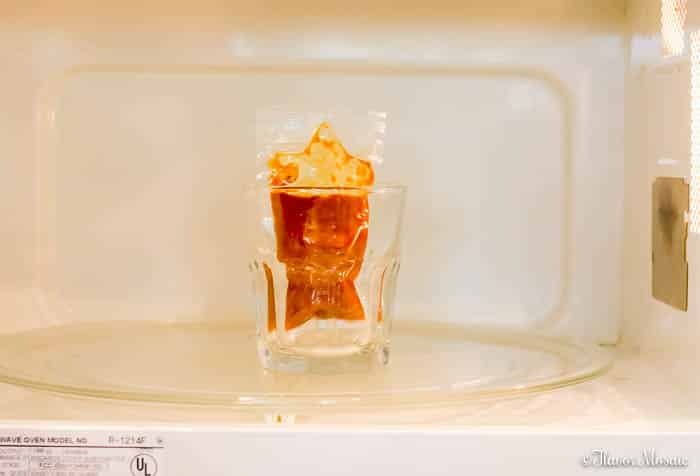 Tear a notch in the top of the sauce packet, and place it upright in a container and heat in the microwave for 45 to 60 seconds. Once all the ingredients are heated, then all you have to do is assemble. I like to add the green beans to the plate first and then the chicken breast. Lastly, pour the tangy red sauce over the top of the chicken breast, and serve hot. All of that can be done in 20 minutes. How do I know this? I know this because I followed the instructions exactly, and everything was ready in 20 minutes when the chicken breasts were ready. It is now your turn. Be sure to grab your coupon and head to HEB to pick up your favorite varieties of Tyson Fully Cooked Dinner and Entrée Kits! Which Tyson Fully Cooked Dinner or Entrée Kit will you be making for dinner?